The Alberta Legislative Assembly has its Hansard online back to 1991. Unfortunately, these records are not accessible. "Select below to view Hansard document:"
Selecting "22nd Legislature, 3rd Session (1991)"
and then clicking on "Go" should bring up the Hansard for that session, but it does not. Same result for each year 1992 through 2005. I tried this with the Firefox browser, and with Microsoft Internet Explorer; got the same unsuccessful result with both. 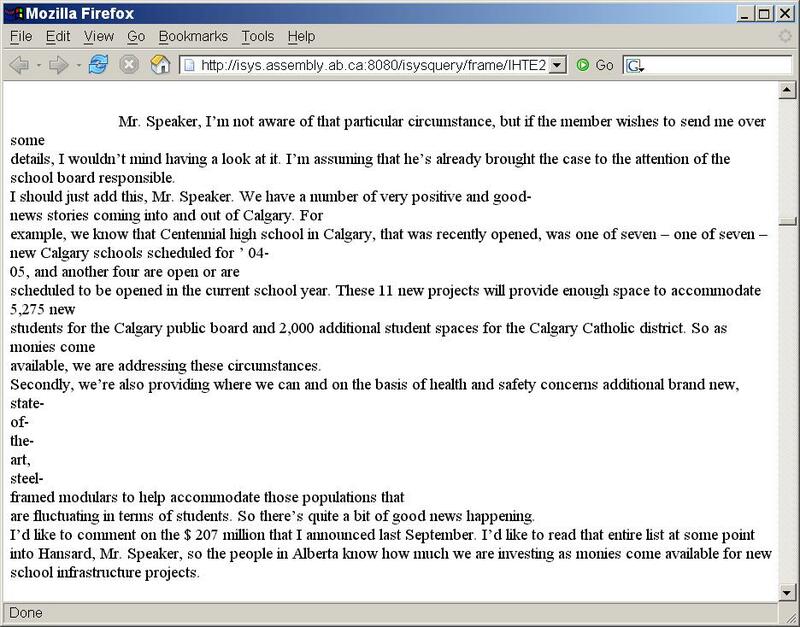 [Later update, April 5, 2006, 16:05 UTC]:– The Alberta Hansard is now working, at least a small part of it. The Hansards for the sessions in 2006 are available, but those for all previous sessions, 2005 through 1991, still do not work. The sessions for 2006 are available both in HTML and in pdf. 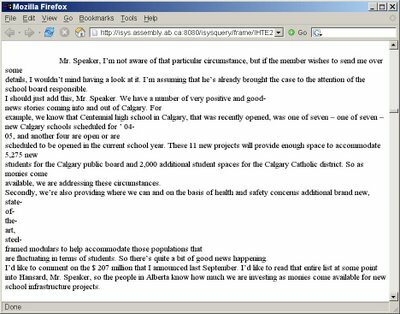 The pdf pages are orphans, of course, but in the Alberta Hansard the HTML pages also are orphans, as for example February 22, 2006, March 15, 2006 and April 4, 2006.
showing ragged text (above) caused by excess line breaks. For a full-size view, click on the image. The same text with excess line breaks removed. A person can access the pre-2005 Hansard PDFs if one goes to them under the "Subject Index" and then chooses the appropriate session: it's not searchable, but it's a way of getting at the information provided that you know basically when the discussion you're looking for took place. Hope this helps.